Grant Achatz has had Chicago critics and foodies raving since he moved to the city in 2001 to become the chef at Trio in Evanston. The hype peaked this year when Achatz opened Alinea, a Lincoln Park restaurant that’s at the forefront of creative cuisine. Achatz recently spoke to The A.V. Club about the pressures of success and why people are willing to spend five hours eating a single meal. The A.V. Club: There was a lot of hype surrounding Alinea before it opened. Did you feel any pressure? 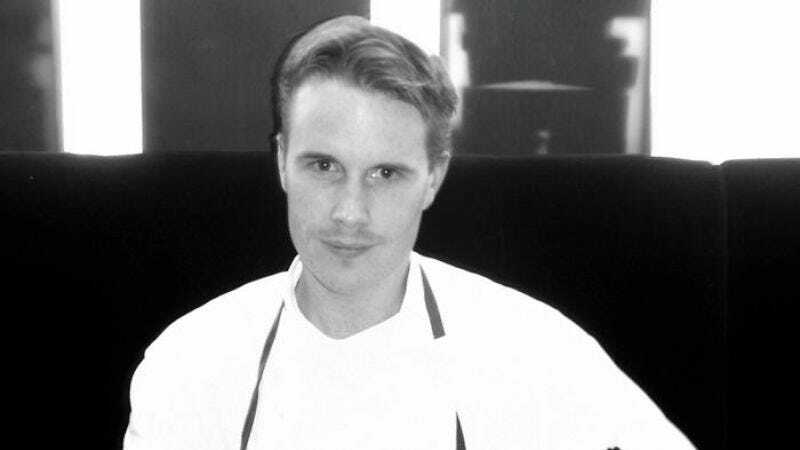 Grant Achatz: Not any more than we would normally place on ourselves, you know? Whatever it is you’re doing, whether it’s your career or a particular focus, if you’re trying to be the best you can possibly be, then you’ll be putting that pressure on yourself. Yeah, there was some hype, and there was some pressure, but that was positive. It really made us stay focused. AVC: How often does the menu change? GA: Four to five times a year—it’s pretty seasonal. We don’t change in one blanket wave. It’s usually four or five dishes at a time, and in the course of three weeks, it will turn over entirely. But that’s ambitious in itself, and it helps us stay on the edge all the time. We never really get comfortable. AVC: What made you decide to come to Chicago? GA: It was really the opportunity at Trio. I was young at the time; I was only 27. I didn’t really want to tackle New York, didn’t really have the interest to live in that city. At the time I was in Napa, and San Francisco didn’t seem like a big enough move, so I saw the opportunity at Trio and thought, “Chicago.” I’m from the Midwest, from Michigan, so I figured, “Let’s give it a shot.” And then once I got here and started doing what we were doing up there, there was no reason to ever really leave. We did exactly what we wanted to do and didn’t curtail it in any way, yet we got welcomed. It was great. And now look at it: There’s this whole cuisine here. We’ve got Moto and Avenues and all these young chefs conglomerating here because it’s become this epicenter for creative food in the country. AVC: It’s pretty remarkable in today’s hurried society that people are willing to take five hours to eat. The largest menu you have is 27 courses? GA: It fluctuates. Right now, tonight, it’s 25. It can go 25 to 30. Most people run through it in about four and a half, depending on the party size and how fast you like to eat. People ask me about the location: “Why Lincoln Park? Why so close to Steppenwolf and all these theaters when there’s no way you can cater to that crowd?” And I say, “Well, that’s it. We’re both.” In a way, we’re performance art. Of course, it’s not like Blue Man Group, where we’re throwing things in people’s mouths. But at the same time, it’s very interactive, and it is very artistic. And people do come here knowing that it’s not dinner for an hour and then on to Steppenwolf. They settle into these chairs, and they know that this is their evening.